Unique design art farmhouse wall clock large decorative for home, office, kitchen, living room, bedroom, bathroom, guest room or dining room. It is also a best gift choice for your friends or your family. Naturally patinated, NOT COLORED. Aluminum dots. HIGH-QUALITY QUARTZ movement used inside the clock is made on one of the oldest factories in Europe, GERMANY and has a noiseless stroke and high accuracy with SILENT function which ensures no ticking to confirm a good sleep or relaxed working environment. Warranty for movement 2 years. Square shape. Size is 12x12 inches (30x30 cm), 2.5 inches deep with arrows. The clock requires one AA battery that is not included. Item accompany with box and backside hanger. Easy To Hang. 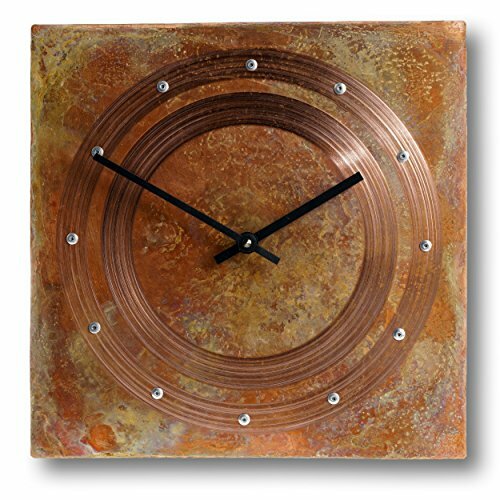 Our copper clocks are not subject to oxidation or tarnish, if its do not get water. It will stay exactly the same for many years. The clock is designed to be placed inside the building. Outside and in the place with high humidity the copper surface may become oxidized and change color. The main idea of these clocks, that every new one clock is not the same as previous. All clocks are made in a single copy, and may differ slightly from each other, so that you will have really unique, original product, good working, decorative and universal wall clock for home and different styles of interior. If you would like this clock in other size, hands, points etc, just send me a message and let me know what you would like to see. If you have any questions about this product by InTheTime, contact us by completing and submitting the form below. If you are looking for a specif part number, please include it with your message.